Stamped Concrete Service Northern Virginia, Maryland, & D.C.
Crescent Design and Construction has been in business for over 20 years now and we are now one of the top leaders in our market for masonry work and using stamped concrete. We are honored every time a client invites us to their home and allows us to enhance it. It is an honor that we don’t take lightly, we will always treat you, your home, and your family with the up most respect. Stamped concrete is made of concrete that has gone through a process called stamping. A mixture of cement and dyes are added in to create the color of the stamped concrete and then after the concrete is freshly poured, a pattern is ‘stamped’ in to the wet material. The stamping process changes the overall look and sometimes texture of the concrete. It is used to make designs that mimic other building materials such as flagstone, tile, slate, wood, stone, and brick. These building materials are often used for outdoor walkways, retailing walls, patios, decks, driveways, and sidewalks. It is also a flooring made for indoors as well. This makes concrete one of the most versatile materials used today and it is cheaper than all of the materials that it mimics. When you imprint patterns in just-poured concrete, you can attain any high-end look that you desire! This flooring is highly customizable because the stamping process allows for the concrete to be shaped, colored, designed, textured and imprinted to look any way that you desire. You can install stamped concrete just about anywhere because its natural look blends in with so many different design schemes. At Crescent Design and Construction we also offer other masonry services in Northern Virginia, Maryland, and the Washington D.C. areas. 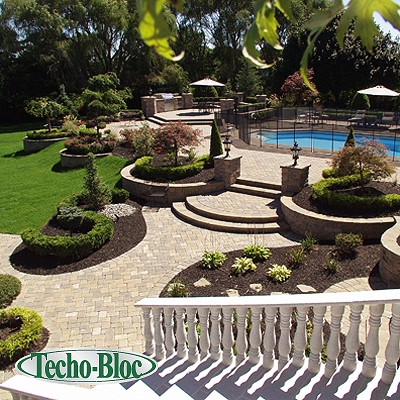 We offer patio design ideas, stone patios, paver patios, concrete patios, garden patios, flagstone patios, slate patios, natural stone patios, patio heaters, patio decks, deck remodels, retaining walls, structural walls, and garden walls, garden walkways, driveways, steps, garages, entry ways, exterior home painting, landscaping, floor resurfacing, pools, outdoor kitchens, outdoor living rooms, outdoor lighting and pool lighting.